I’m not a big fan of using colour pencils. I find them very labour intensive and I guess bad childhood memories still abound of those terrible colour pencils in kindergarten where you virtually had to carve into the paper to get some colour out. Watercolour pencil & marker technique: A step by step demonstration on how to use watercolour pencils for outline then using the wetness of a marker to draw out the pencil colour for shadows. This works best on bleedproof paper. I was introduced to aquarelles (watercolour pencils) when I did my graphic design course. However, we used them for tv storyboard illustration techniques. 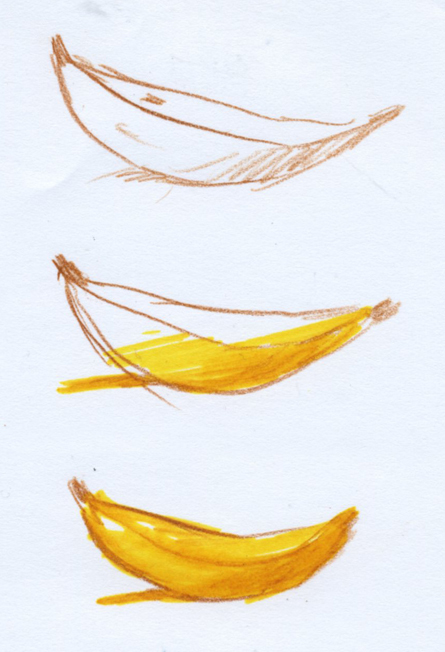 Basically you would use the aquarelles to draw in all the linework, a bit of shading etc. Then “brush” over them with coloured markers like Copic or Pantone markers (in my day it was Yoken), the wetness of these kinds of markers would blend the aquarelle work in with the markers. It gave your illustrations a bit more dimension. 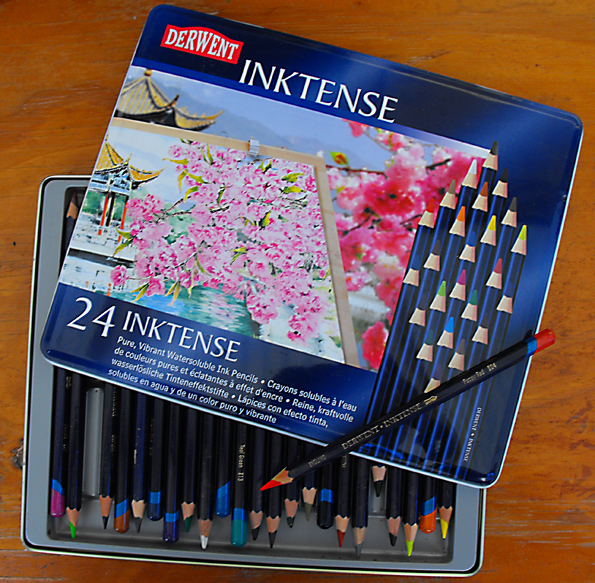 Aside from that, I’ve never been overly excited by watercolour pencils. The amount of work pencil work you put in to the drawing, I find that when you apply water the results aren’t that expansive. 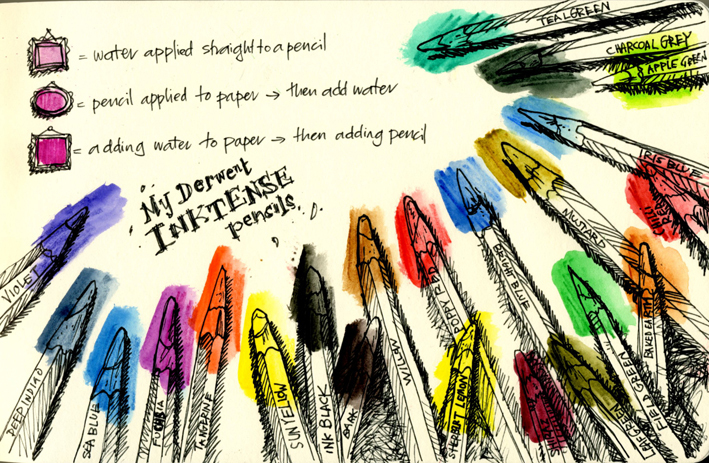 That’s why my mind was blown away by Derwent’s Inktense pencils. I bought them online on a whim and was quite impressed not only by the amount of colour that leaps out when you apply water but by how little pencil work you do need to get that colour. What I like about them is that it doesn’t try to hide either the pencil side or the wash side, and it isn’t one dominating the other. It’s a really good balance. One thing I love about these pencils, and what some watercolourists might enjoy, is that because the pigment lifts off so easily and with so much saturation, you can grab some of the colour and use it in other sections of your painting. For instance, in my lighthouse sketch, I didn’t add a pencil to the sky (the linework you see was put in was afterwards). I took some of the wet pigment from the lighthouse and used it to colour the sky. The same with the darker shadows in the merry-go-round. Having the same colour tones in the sky as on the building unifies the picture. For me it’s akin to how some watercolourists don’t like to change the water in their jar until the painting is finished. 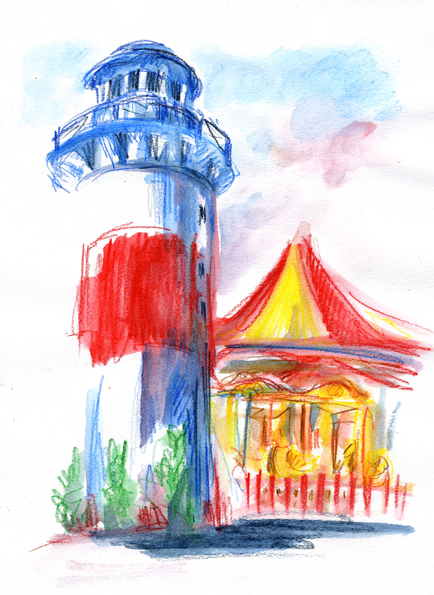 The other plus for Inktense is that you can layer over your first wash once it dries. I’ve not tried this, but I think you will need to use proper watercolour paper, or something with a good tooth on it. Example showing how saturated inktense pencils are – I used the watered down pencil area from the water and the boat sails to paint in the clouds and sail reflection respectively. For more of my Inktense artwork please click here. I have been working with Inktense pencils on watercolor paper and it is certainly worth it to layer them, especially for portraits. I have also included some regular water soluble pencils and more importantly, straight watercolors. I really like to draw my initial drawing in a darkish color, activate the pencil and work in washes, and then allow it to dry so one may add more color with the more transparent watercolor. I have been using Fabriano 140 lb., and more recently, Strathmore Aquarelle II for sketching (since it doesn’t buckle.) I have recently seen a review of Stonehenge 300 lb. Watercolor paper that makes me want to try it because it apparently dries flat. Thanks for the reply. Yeah they are so versatile and being able to reuse them or transfer some of the colour wash to other sections. I also occasionally dilute them with watercolours too, i.e. instead of water. Admittedly I’ve only ever used them in an expressive way, but I should try your layering technique. Sometmes I have drawn with the inktense and not paint over because the lead isnice and soft compared to colour pencils, but i get so into the drawing I’m too scared to add water because it will be so intense! There’s so much you can do with them!